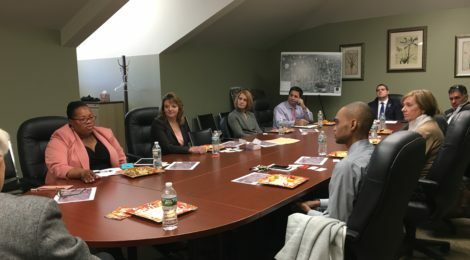 Downtown managers and economic development directors in Union County met recently for lunch and networking, and decided to meet regularly to share ideas, concerns and experiences. The first gathering, hosted by Scotch Plains, came about when long time Downtown New Jersey board members Kathleen Miller Prunty, director of downtown business and economic development in Cranford; Sherry Cronin, director of Westfield Today; and Beth Lippman, director of the Livingston and Springfield business improvement districts talked about what were called Manager Meetings organized by Downtown New Jersey. “Those meetings were so important early in our careers,” said Ms. Lippman. Ms. Miller Prunty, who frequently fields telephone calls from other towns, thought it would be worthwhile for directors to get together regularly to discuss pressing issues and how the directors are dealing with them. “We are all part of the greater Union County area and it’s in our best interest that every town be successful and vibrant,” she said. The recent gathering focused primarily on redevelopment, and in particular on best practices for communicating with business and property owners at every stage in the redevelopment process. Scotch Plains Mayor Al Smith joined the group, which, in addition to Ms. Miller Prunty, Ms. Cronin and Ms. Lippman, included Liz Jeffery of Fanwood, Joseph DeIorio of Kenilworth, Cindy Reis of New Providence, Ron Johnson of Plainfield, Thomas Strowe of Scotch Plains, Michael Scalera of Springfield and Fatimah Raymond of Union. Photo: At the first of what will become monthly networking and sharing lunch meetings, from left: Fatimah Raymond, Union; Sherry Cronin, Westfield; Cindy Reis, New Providence; Joe DeIorio, Kenilworth; Tom Strowe, Scotch Plains; Mike Scalera, Springfield; Kathleen Miller Prunty, Cranford; Ron Johnson, Plainfield. ← Downtown New Jersey Conference Photos!